Preheat oven to 375ºF. In a small bowl, stir together flour, baking soda and baking powder, set aside. In a large bowl, cream together butter and sugar until light and fluffy. Beat in egg and vanilla. With stand mixer on low, gradually add flour mixture; beat until combined. 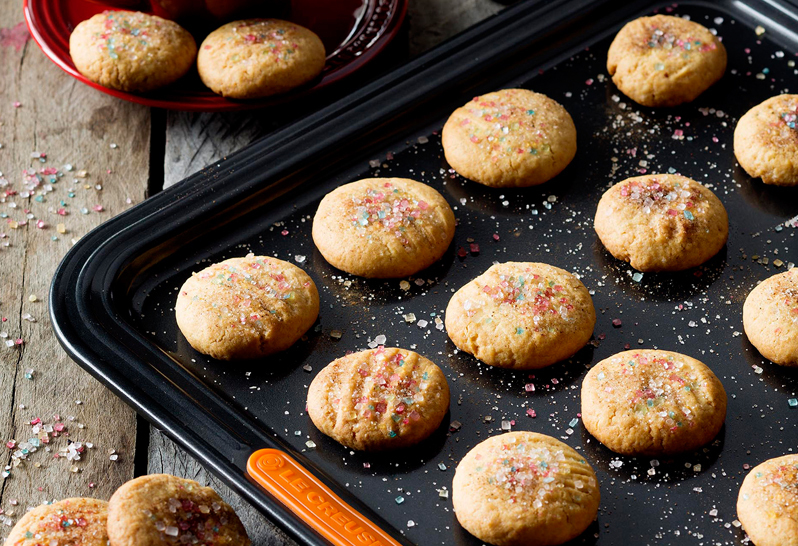 Roll rounded teaspoonfuls of dough into balls and place on ungreased cookie sheet. Press down gently with a fork to desired thickness. Bake for 8 to 10 minutes, rotating halfway through, until edges are golden (depending on size). Let stand on cookie sheet for two minutes before removing to cool on wire racks. Decorate with assorted candies, sprinkles, or coloured sugars as desired.